Home Blog Page Big Uncategorised Gift yourself a beautiful winter garden. Gift yourself a beautiful winter garden. We all love our gardens during the summer, after all what is not to love. Bright and beautiful blooms, a seemingly endless rainbow of colour and all the life and vibrancy that you could ever want. But, come the winter we start to fall out of our love affair with our gardens. Even the most cared for space can quickly look grey and dreary, leaving you less than impressed by your outdoor living space. You may be tempted to simply close the curtains and pretend like there is nothing out there, but we think that instead you could embrace your winter garden. We have put together some of our top tips to gift yourself a beautiful winter garden, rather than one that you want to hide away from. During the summer months you may not notice an evergreen plant amongst all the colourful blooms, but as they die off in the winter, you will be thankful for the rich green tones of the evergreens. 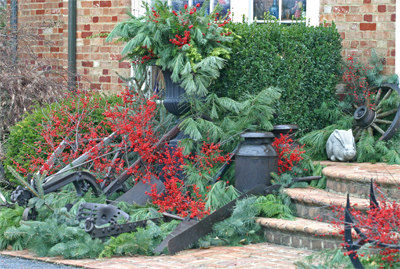 We highly recommend choosing evergreens in a whole host of different sizes and shapes. Laurels, Sencio and Phormium work brilliantly in your garden and will allow you to enjoy it throughout the seasons. Spicing up your garden is a sure fire way to have an interesting space during the winter months and what better way to give it some character then with a spot of topiary. Topiary is taking a shrub or hedge and pruning it into an ornamental shape. Whilst some people equate this to an animal or other fun shape, you don’t have to go that crazy! Simply opt for a shape that you like, round or squared off and have it planted in a pot. Whist they look great on their own, they are going to look all the more beautiful when the snow starts to fall. A statue, arch, or large ornament is an easy way to make sure that your garden looks gorgeous through the winter is with non plant additions. Find yourself a beautiful feature point and pop it in your garden. They come in a variety of forms and you are sure to find one that is right up your street. Meaning that you will still have something to admire, even if the rest of the garden isn’t yet come to life. Just because the weather is cold it doesn’t mean that you can’t have some colour in your garden. Whilst evergreens cover the greener end of the rainbow, there are other plants and flowers which can add some other shades. The colourful stems of cornus are great, or instead you could go for the festive classic that is a holly bush. You may even be lucky enough to entertain some flowers too. With snowdrops, aconites and hellebores all a possibility. These are just some of the ways that you can make sure your winter garden is still one to be proud of. So, get out there and see what you can do, you may just be surprised by how beautiful it can look. Previous Post	Worried about snakes in your garden?